The story in the picture spells out perfectly what happens with where we allow our thoughts to live. The things we constantly think are the food to our own personal wolves. Feeding them, growing them, providing them with life is what we do with what we think. If our thoughts dwell in negative spaces such as anger, blame, self-doubt, lies, jealousy, worry, and other negative thoughts and feed those to our mind, body, spirit (wolf) that is the wolf we will grow. That is the wolf we will make stronger. That is the wolf we will then be living with every moment of every day. If, on the other hand, or the other wolf, our thoughts dwell in positive spaces such as peace, love for ourselves and others, hope, kindness, truth, self-confidence, taking responsibility, faith, and other positive thoughts and feed those to our mind, body, spirit (wolf) that is the wolf we will grow. This wolf will grow and become stronger. This wolf will be living with us every moment of every day. So which wolf grows stronger? 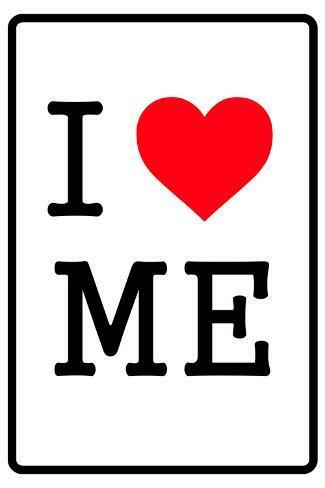 The one you CHOOSE to feed. Even though constant, repeated thoughts become automatic after years of thinking them, you can still train yourself and your mind to choose differently. You can CHOOSE what thoughts you think or you can CHOOSE to replace thoughts with different thoughts. 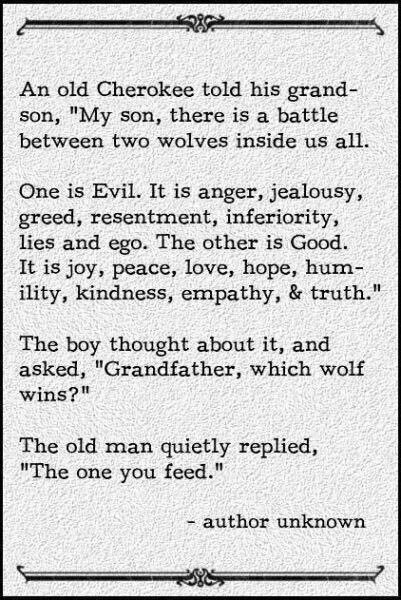 You choose which wolf you feed. If you have been feeding the negative wolf, when the negative thoughts pop up replace them immediately with positive thoughts. Repeatedly do this over and over and those thoughts will become automatic and they will also nourish and grow your positive wolf. It will become so strong it will overpower the negative wolf just as in real life, the strongest survive, the ones who are fed well survive. What do you feed? Mindfully, consciously, you can choose which wolf to grow.